The baseball team continued to roll after storming out to an 8-3 start over spring break, improving its record to 13-4 on the year with wins over Keene State yesterday and Plymouth State on Wednesday. The Tufts offense, which averaged nearly 11 runs per game during its torrid swing through North Carolina and Virginia, remained hot despite lingering winter temperatures. With Huskins Field still unplayable, the Jumbos have temporarily re-located to New England Baseball Complex — a new outdoor baseball facility in Northboro, Mass. “Our guys have done a great job traveling an hour away to play home games,” coach John Casey said. Tufts breezed through its first game back, bludgeoning Mass. 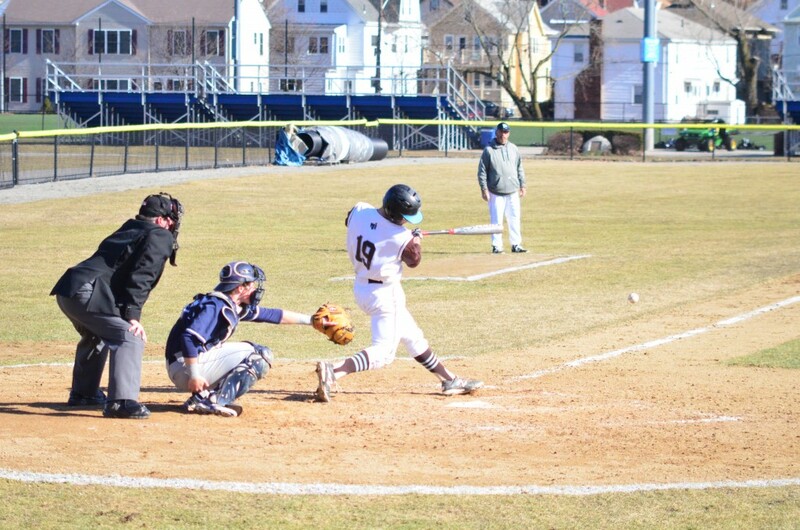 Maritime 9-0 as seven Jumbos combined to shut out the Buccaneers. Junior Matt Moser contributed a no-hit inning out of the bullpen in addition to going 3-for-4 at the dish with two runs and two RBIs. Sophomore starter Charlie McQuinn earned the win for Tufts, his first of the season. Last weekend saw Tufts take on Bowdoin in what was both teams’ first NESCAC series of the season. The Jumbos dropped Friday’s opener, falling 6-1 despite yielding just five hits. They were unable to muster much offense against Bowdoin senior Henry Van Zant, who went the distance while surrendering a mere four hits and one unearned run. Tufts returned the favor in the nightcap, however, beating Bowdoin 6-0. Senior tri-captain Connor McDavitt led off the bottom of the first with a home run — his first in over three years — to give the Jumbos an early lead. Tufts gradually padded its cushion as the game wore on, plating two runs in the third, one run in the fourth and two more in the seventh. Meanwhile, junior Andrew David was untouchable on the mound, making quick work of the Polar Bears en route to a six-hit shutout. David, who pitched his first shutout since 2013, was named NESCAC Co-Pitcher of the week along with Van Zant. “David has continued to pitch well, as he has all season so far,” Casey said. Tufts took Monday’s series finale behind a similarly stellar outing from senior tri-captain Kyle Slinger. After being sidelined for two weeks by a fluke concussion, the preseason Div. III All-American returned to form with seven innings of one-run ball. Keyed by home runs from senior catcher Bryan Egan and sophomore second baseman Tom Petry, the Jumbos cruised to a 10-1 victory. Wednesday’s 6-4 win over Plymouth State was much closer, with the Jumbos taking advantage of five Panther errors for three unearned runs. Tufts was also sloppy in the field, making two defensive miscues that allowed Plymouth’s first three runs to score. The Jumbos ultimately prevailed using six pitchers, with senior tri-captain Tom Ryan earning the win — his first of the season. First-year Zach Brown notched his first save of the year with a perfect top of the ninth. Yesterday, Tufts stretched its winning streak to four with a victory over Keene State. Sophomore lefty Tim Superko allowed six hits and no earned runs in eight innings on the hill. The Owls struck first in the second inning after a throwing error and wild pitch allowed first-year Kolby Reggione to score on a groundout. However, the Jumbos would score eight unanswered runs to lock up the victory. Casey pointed out a number of players who have propelled the team to its hot start. Tufts will try to maintain its winning ways in tomorrow’s doubleheader at Brandeis.